St. Tim's 2018 Retreat: "Healing Through Worship"
Join Us at This Year's Retreat! 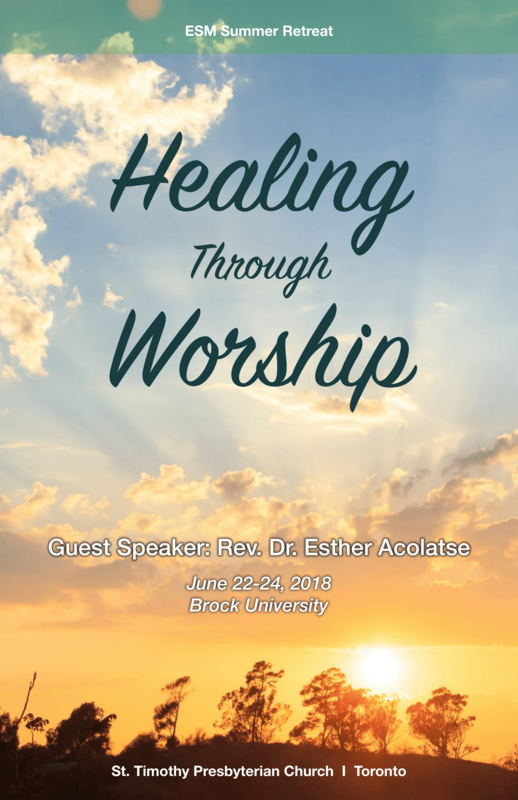 Our theme for 2018 is "Healing Through Worship". Our annual retreats are a great time to reflect on one's journey, find spiritual renewal and form deeper bonds with the community. Plus, we have a great new facility this year at Brock University! Why Should You Go To The Retreat? We have a special guest speaker this year, Rev. Dr. Esther Acolatse, Associate Professor at Knox College. She will be talking about Personhood and the Spirit. It will be an amazing time of self-discovery and exploration! Retreats are a great time to get away from it all and focus on the inner self. Reconnect with God in the beauty of nature! Retreats forge new and deeper bonds with others in the community. Connect with others through discussions, games and fellowship! Register Now for the Retreat! We believe this much in the importance of the retreat that we have invested a large budget for it. We believe this is the one time where we can gather as a community to reflect on our spirituality and deepen bonds with one another. We want you there! If you're registering as a family, only ONE registration form is required! We will enjoy great new facilities this year at Brock University! Official program will start at 7pm on Friday and end at 12pm on Sunday. Plan ahead: Beat the traffic and come early on Friday to enjoy the facilities and weather. *No dinner will be served on Friday. For any questions or special requests (such as dietary requirements), please contact Deb Chang (debchang3@gmail.com) or Veronica Park (vhpark8583@rogers.com).